New York City’s residents aren’t exactly known for being conservative in their fashion sense. However, even in the city that never sleeps, it was easy to tell as I walked the streets of Manhattan that I was getting closer to the site of the 2010 New York Comic Convention. As I approached, I spotted fans dressed as comic book icons with intensifying frequency. Avatar, The Incredible Hulk, The Predator — they were all present on the streets of Manhattan this past weekend. Apparently, Halloween wasn’t the only opportunity this month to dress up in costume and skulk around the city! Let me just start off by saying that this year’s Comic Con was absolutely insane; there were what seemed to be a million attendees spanning out over a mile radius from the Javitz Center where it was held. This was most likely due to the fact that the event organizers decided to collocate it with Anime Con for the first time this year. 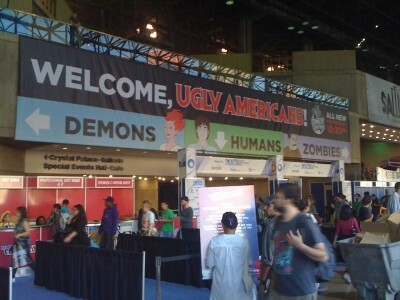 Consequently, there were far more fans than I recall seeing at the 2009 Comic Con. Nonetheless, it certainly made for some interesting costumes, which is always a delight to see. 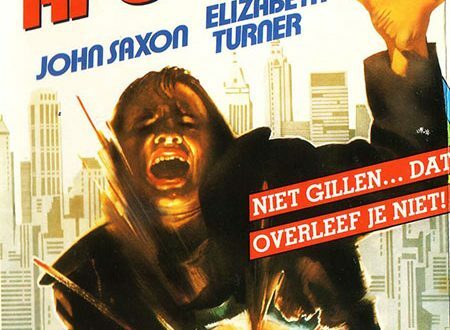 As far as the presence of horror-related goodness, there was no shortage of it. What follows is a taste of what this year’s event had to offer. Rockstar Games, the creators of Grand Theft Auto, graced Xbox 360 owners with arguably the best game to come out this year, Red Dead Redemption. 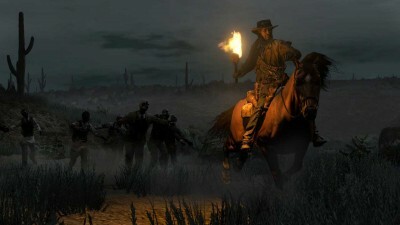 Now, they are hopping on the zombie bandwagon by producing an expansion to the original game, called Undead Nightmare. 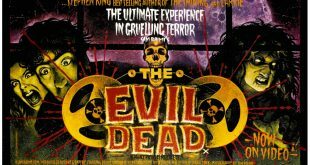 It features zombie westerners, as well as 40 species of zombie animals for gamers to blow to pieces…lest they’d rather have their brains eaten. I actually had an opportunity to play an exclusive demo of the game, and let me tell you, it was a lot of fun! The original game play mechanics from Red Dead Redemption have remained intact, but, thanks to the zombie makeover, it really does genuinely feel like what is being offered from Rockstar is an entirely new game. The demo I played took place in a graveyard. I was charged with the simple task of taking a torch to coffins scattered around the premises. 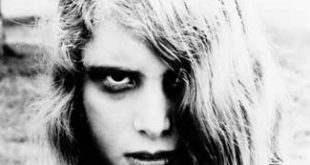 Upon activating the task, hordes of zombies start coming out of the woodwork, at which point I could choose to keep my distance while navigating the map to set the coffins ablaze, or I could go with the more bloody option of exterminating the undead roamers. Naturally, I took the bloodier route. The controls were tight and responsive, and if I was close enough to a zombie when pressing the trigger, the screen would transition to a close-up of my character putting his shotgun to the zombie’s chin, blowing bloody chunks of his zombie brains all over the screen. Zombie brains blown to bits! Other than the game being great, the booth was very well thought-out. 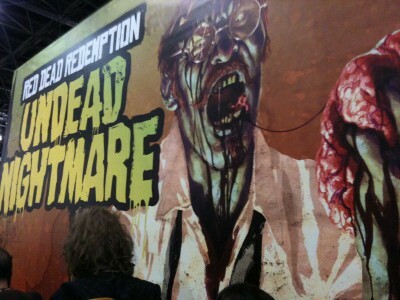 Representatives urged you to “check-in” at the booth via Foursquare and tweet with #UndeadNightmare. Once inside, there were about 5 or 6 pods where you could demo the game. They were also giving away free t-shirts and badass posters! The demo was very promising, and a Rockstar representative said that the expansion promises a full single player campaign. It’s set to be available sometime this fall. 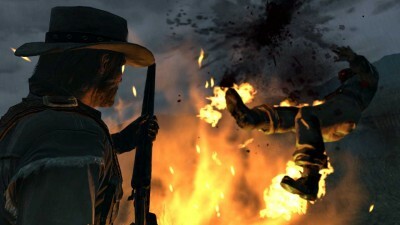 Check out more info about the game and the official trailer here: www.rockstargames.com/reddeadredemption/. 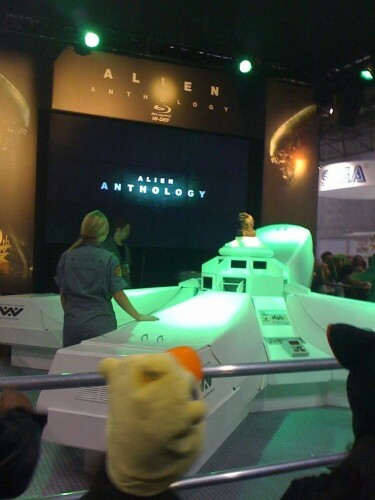 20th Century Fox had a very elaborate and amusing kiosk set up for a relaunching of all four of the original Alien films in the high definition Blu-Ray format. There were several space craft-inspired pods set up in which onlookers could go sit down and view the trailer for the Blu-Ray anthology in darkness. Meanwhile, the trailer was on loop up on a large display, and the transfer, from what I could tell, looked gorgeous. I may have not truly appreciated how much the film had been cleaned up and remastered for this transfer had it not been for the coincidence that I just so happened to watch the original Alien movie on DVD a few days before. However, I have to admit, I was a bit disappointed. I am quite the Alien fan, and from a distance, the set up was so elaborate that I found myself looking around for something more than a relaunch of the original movies. I almost felt that if I looked hard enough, I would find some sort of hint at Alien 5. Needless to say, I did not. I can’t complain too much though, as I will be picking up my set of Blu-Rays and watching them in all of their high definition glory when they land in stores on October 26th. I was quite surprised and happy to see that Rubie’s, a big costume manufacturer, was in attendance at the Con this year. It served as a great opportunity for Con-ers to grab a costume of their favorite comic book hero on-site and join in on the costuming fun. With how close the event was to Halloween this year, it was also a great opportunity to start scoping out one’s Halloween get-up. Being the big Halloween fan that I am, I was impressed with the selection; they had some costumes that I’ve definitely never seen in stores before! 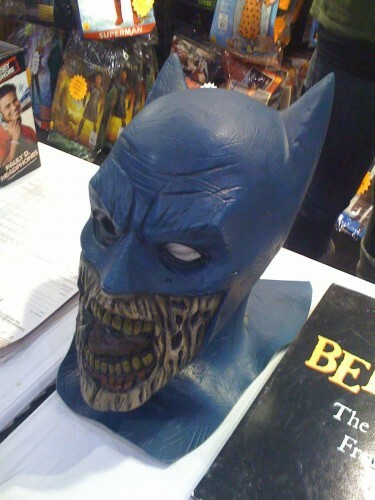 My favorite was hands down the zombified Batman mask (pic below). Check out Rubie’s Costumes here: www.rubies.com/. One thing is certain, there was no shortage of space dedicated to the ‘Artists’ Alley’ which, as you may have guessed, is where all of the artists take up residence for the three days. There was a plethora of talent, so these are just a few of the artists that caught my attention. Arthur Suydam was present with a fairly extensive selection of his work from Marvel Zombies. Suydam was primarily responsible for creating the cover art for the 5 issue series that ran from December 2005 to April 2006. He has also done comic book work for Batman, Predator and Aliens, as well as work in magazines such as Heavy Metal and Epic Illustrated. Arthur’s official website is: www.arthursuydam.com/. Also in attendance was Brian Ewing showcasing his newly published book of art. 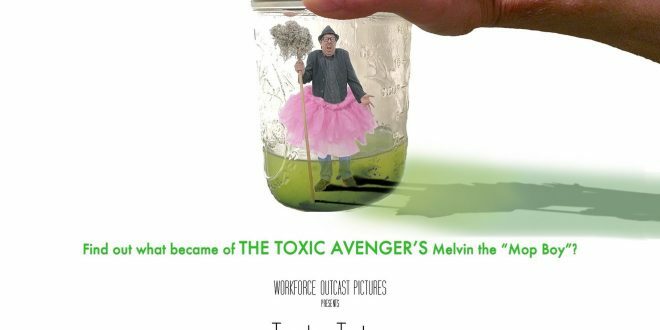 Ewing has a pretty extensive resume: he has created posters for various bands, such as Queens of the Stoneage and Converge, as well as artwork for several magazine publications. I asked one of his representatives what he has brewing for the next year, but she was keeping her lips sealed and simply said, ‘we are working on a few projects.’ Check out his artwork at www.BrianEwing.com. 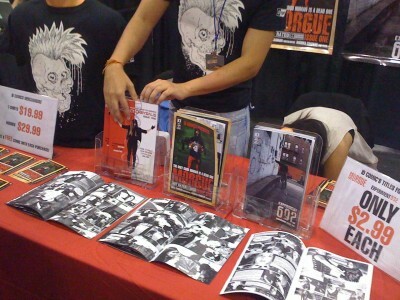 One of the more unique offerings from this year’s artists was a comic book called “Morgue.” The comic book, published by ID Comics, was having its launch debut at Comic Con this year. The description follows, “Enter Karl Morguson. A boy who dreams of a better life, he carries dark secrets that are hidden from his parents. In the first issue, there will be revelations that will shock everyone. Follow as Karl navigates through the mine field that is his life. It’s a story that can be identified with, at first. However, as things start to break down we realize how different Karl really is.” “Morgue” is part of the Tiber Saga, and acts as a direct tie-in to “Experiment 692” and “Project Chrysalis.” What I thought was so cool about this particular comic is was that it uses real life models behind a green screen to render the art. 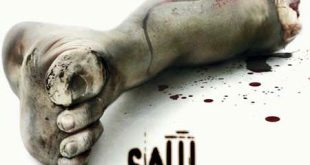 Check out more info about the comic here: www.idcomics.com/html/morgue.html. 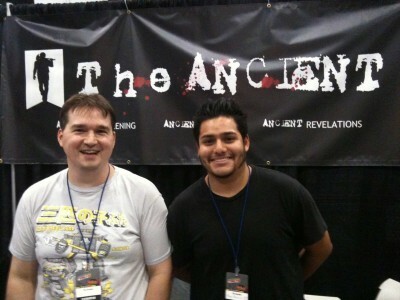 The Ancient was a horror/action/comedy novel series that caught my attention at the Con. The series consists of 3 separate novels: Ancient Awakening, Ancient Enemies, and Ancient Revelations. The book series, “follows the adventures of eccentric demon hunter Joseph Miller. His job is to defend the human race against seven mythical demons and their offspring. Unfortunately for us, he has been dead for the last hundred years.” The author, Matthew Bryan Laube, was at the booth, so it was fun to have the opportunity to talk to him. 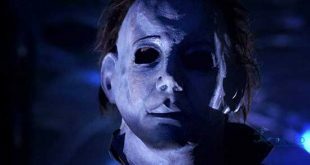 I was especially excited wieh Matthew and his PR friends mentioned that the story takes places in Newark, NJ, as I grew up in Jersey and know that Newark can be quite the grimey setting for a horror story! You can learn more about the book and even read some chapters for free at the official website here: www.ancientawakening.com/sample.html.